The range of the peregrine falcon is nearly world-wide. 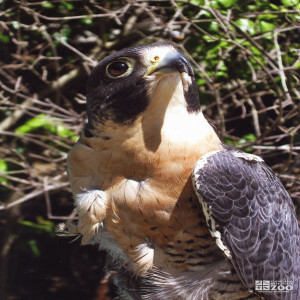 Peregrine falcons inhabit seacoasts, mountains, rocky crags, and temperate forests. A fast, dashing flier, this falcon travels everywhere at a fast speed in a level, driving flight or in spectacular dives. They perch for long periods on ledges or trees, feeding on small to medium-sized birds, usually taken on the wing, then carried to a perch to be eaten. They often hunt in the early morning and late evening in dim light. They nest on bare ledges and on high cliffs and are often noisy in the nest area with harsh screams of “kak kak kak” and whines of “keer-ik keer-ik." Peregrine falcon nests are made by scraping out a shallow cup on the shelf to hold the eggs. Sites are often re-used season after season, and pairs tend to frequent the nesting area for much of the year. They breed in early summer, the female laying her clutch of reddish-brown eggs during August or September. The sexes share the incubation duties, with the female doing the most. The eggs take about 30 days to hatch, and the nestling fledge in 35 to 42 days. At the time of hatching, the chicks are covered in dense white down, but this is soon replaced by the juvenile plumage.